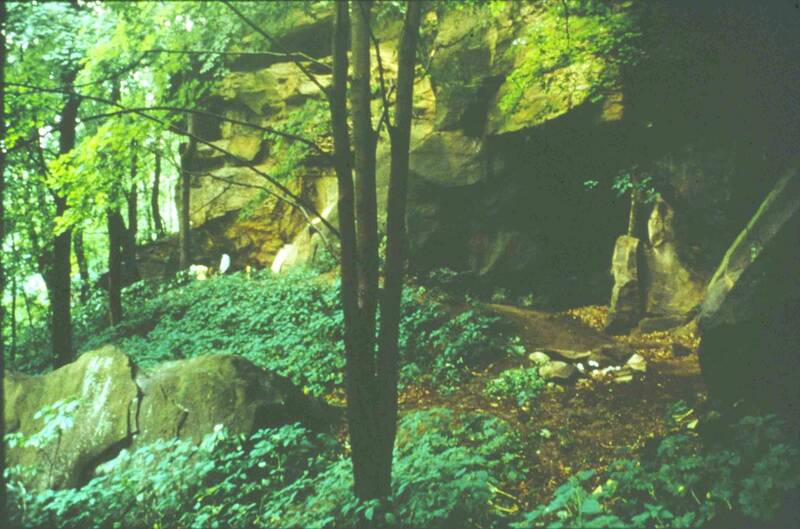 Meadowcroft Rockshelter in 1973 prior to excavation. In June 1973, a multidisciplinary team of University of Pittsburgh students and faculty led by Dr. James Adovasio first arrived at the Meadowcroft Rockshelter. 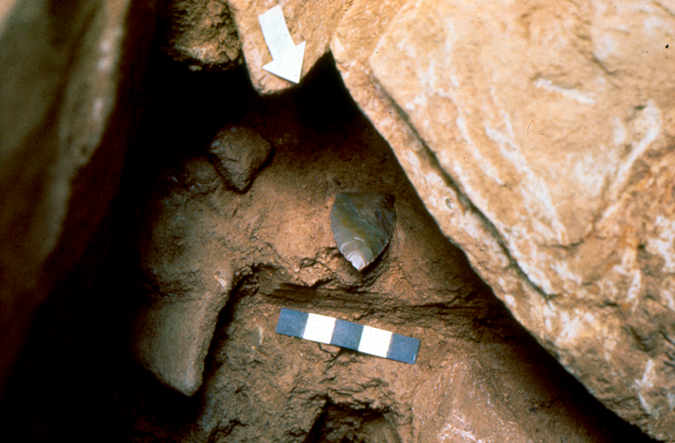 The team’s intent was to set up an archaeological “field school” to train students in utilizing modern, rigorous investigative techniques across a broad spectrum of sciences to fully “flesh-out” or “set the stage” of the Rockshelter’s prehistoric past. Their initial expectations were not high, since it was well known that other Rockshelter excavations in the region were seldom very deep physically and did not span large swaths of human pre-history. As they viewed the large area under the massive sandstone overhang, its great height, and the twinkle of joy and expectation in the eyes of Albert Miller as his 18-year quest to have the shelter excavated had finally come to fruition, the team was imbued with a palpable sense of heightened expectations. By 1976, they had excavated through 11 distinct layers of sediment while meticulously uncovering and cataloguing artifacts and plant and animal remains. They had uncovered manmade features like fire pits and occupational floors where ancient visitors had burnt off accumulated debris before camping . Now they had reached a layer that was more than 10,000 years old and were still finding evidence of human occupation. Initial expectations regarding the site’s depth, age, and complexity had been shattered, and their premonition that it would yield something extraordinary would soon be realized beyond anyone’s wildest dreams. It was July 31, 1976  when the Miller Point was discovered by Joe Yedlowski. Little did he know that it would spark one of the biggest controversies in North American archaeology – the idea that the continent was inhabited well before the 11,500 years previously believed. As he slowly uncovered the artifact, the field notes reflect a changing viewpoint of the discovery. 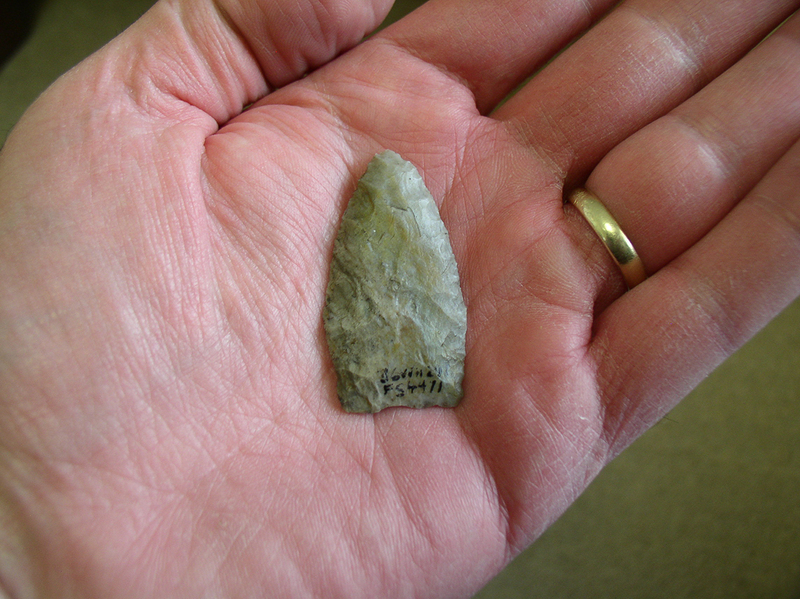 Field notes at 1 p.m. read: “Is it a flake”, “It’s a bifacial blade”, “No it’s a Lanceolate Point!” (2). At 5 p.m., the field notes state, “Site cleaned up….crew left for Lou’s…the above mentioned projectile point is labeled and locked in cabinet at Mine House” (2). By the time the raucous celebration at Lou’s ended, the crew was responsible for the Pleistocene-like extinction of 10 kegs of beer (3). Sometime in the midst of the revelry, it was agreed, by unanimous acclimation, to name the point the Miller Lanceolate to honor Albert, the man whose wisdom, patience, tenacity, and generosity had made it all happen. Although Lou’s Bar no longer exists, the celebration that night remains legendary, at least in the minds of the sleepy hamlet’s older residents, as do many other credible and incredible tales of those halcyon days of the Meadowcroft Dig. The Miller Lanceolate was determined to be 12,000 radiocarbon years old. This is equivalent to 14,000 calendar years. Albert Miller Journal entries 7/21/76 – 8/10/76. Meadowcroft Rockshelter field notes 7/31/76. Jim Ulery is an Interpreter/Tour Guide at Meadowcroft Rockshelter and Historic Village. We used to camp in that area and repel of the rocks right in that immediate area. Mr. Miller was a dear kind friend of mine and my friend, who always went with me. This was at that time when the discover was made. I have also been to Dr. Adovasio’s lecture on the find at Meadowcroft.